Don’t let your recordings get stuck in your device! Free them with RADYO 5.1! Send them with e-Mail, use iTunes Filesharing or your internet browser to download or listen to them! RADYO 5.1 is currently the only application on earth which compresses live music on-the-fly and allows “personal” file transfer of the recordings with 4 different ways. RADYO, with your support, wants to stay as the leader mobile radio entertainment application and continue to inspire other applications since 2009. – Download your recordings to your computer or listen them from another device! – Ability to choose the image from alternatives, before sharing the “Now playing info” on Facebook. – Player now remembers the previous position and starts playing from where it is left. – Filter feature added to the settings to prevent unwanted access to some features. – Rarely, app was loosing the ability to run in the background and requiring a complete restart of the app to restore the ability. – Rarely, after a phone conversation, RADYO wasn’t auto-reconnecting. – Sometimes, e-Mail and SMS share forms were staying on the screen and requiring a complete restart of the application. – When trying to share “Now playing info” on Facebook, an empty dialog was appearing because of a change made by Facebook. – RADYO was unable to connect to any Shoutcast station if it was added to the favorites without listening to it. – Update service was unable to work in China and some other countries. * Above situations are resolved. Radyo 4.4 is out with many new features! – Retina display support added with high quality redesigned graphics. – Added option to stop the radio automatically when Headphone/Audio cable is unplugged. Forget about stopping the radio manually while leaving your car! – Also Added option to automatically start the radio again when Headphone/Audio cable is plugged. – Added custom station feature and new station request form. If you know enough detail add your station to the list, if not let us know! – Up to 4 times faster station list/region changing! – Favourite button moved to the right to prevent unwanted touches. – Single and categorized favourite list! Favourites are now available together application-wide and not limited to the selected region. You can mix stations from any region and filter them with genre! – Search box minimized to free the space for new features in the top function bar. – Media panel will (optionally) show higher quality cover and artist images. – Added High Quality Images switch to options panel. – Twitter sharing is now faster and easier. – Sharing is now just one touch away and easier. – Email and SMS options are added to the sharing choices. Send the channel you listen to your friends and they will immediately start listening to the same channel by touching the link in your message! – Easy sign-out button added to the sharing panel. – Added helpers to better and quickly learn the usage of the application interface. – radyo:// link sometimes was not worked as expected while in the background mode. – Connection failure was sometimes appeared above other screen elements. – Artist and song info were not recognized accurately on some stations using different playing info template. – Connection retry was sometimes canceled too early. – Application was sometimes freezing for 1/10th of a second during station change. – Changing radio region was sometimes showing an empty list, if the last selected genre does not exist in the current region. – Updating the station list was clearing the filter of the list. – Returning back from a phone call was sometimes causing playback problems. iPhone RADYO – radio application’s “3.0″ version is out! This is a huge feature. There was something missing in RADYO, but it was hard to find it out clearly. Sometimes, People need people… Even while listening to radio. ( Some kind of socializing ). This was missing in RADYO until today! As the first steps of this change, now a chat service is available in this version so you can chat with anyone listening to the same station with you! You can also chat with anyone from the world or only from the country you selected. 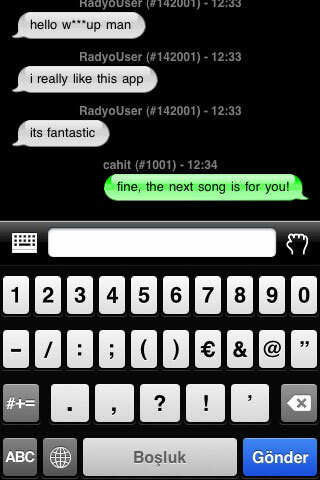 You can gift the next song to someone you just met! Like you were in a cafe and no tv was invented. Chat service is made specifically for RADYO application and does not use any other chat service other than it’s own! Just tap the chat button and you are ready to go! No registration, no setup, just chat. Facebook support has already been there. But with this version, Twitter and Friendfeed support are also available. Now you can share what you are listening & your message with your friends or followers. Since the sharing system does not just put simple browser windows in the application and it uses Direct API’s from the service, it serves faster and better! So few applications succeeds to work after many hours of silence; RADYO managed to work after many hours of silence after the screen is locked. Now you can wake up with your favourite radio station! If you don’t stop the music and try to sleep with music, you’ll be alerted with an annoying song after 5 minutes ( selectable option ). Touch anywhere on the screen to stop the alarm! You are curious about your battery charge status? Ok, now you can define a limit for RADYO application to stop when battery charge drops below that that limit. In general, (some) radio applications in Desktop computers, laptops and mobile devices have a good feature that shows the bitrate of the station you are listening to. However it’s an easy task to do because the station already tells it’s bitrate as an information message, it’s a good feature! People demand this. For RADYO application.. From the very beginning of this application people wanted to see the bitrate of the music, they wanted to monitor the quality and the traffic. Here it comes! RADYO with it’s 3.0 version, does not use the bitrate information given my the selected station; it finds it out itself! New, bitrate monitoring system dynamically calculates the transfer speed and determines traffic. You can even see the difference when news or photo related to the song/artist is changed while you listen to the channel. This is again one of – “one of it’s kind” features! 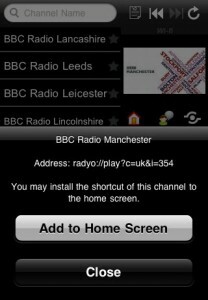 Your favourite station does not have to make it’s own iPhone application anymore!!! While listening to your favourite station, touch to the image on the up-right (related to the station), you’ll be presented with the station’s url and options to add it to your main screen! These can be immediately changed and extended if your favourite station contacts us to customize install pages, icon and expand the module for their station (absolutely free)! It has never been so easy! Quota feature has already been there to limit the usage of GSM or Wi-Fi network. But it was a mistery before to know when the application will reach to this limit. Now with RADYO version 3.0, you’ll know when your quota will be filled up and your possible listening duration! You can click here to download and start to use RADYO in seconds! – Battery Management – Stops radio transmission if battery status goes below the specified limit. 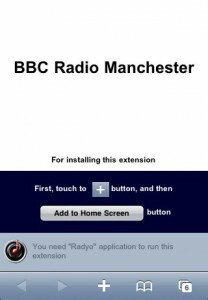 – Radio Station Extension System – Add your favourite stations to your home screen! – * Wakeup Timer/Alarm Clock – Wake up with your favourite station! – Global, Country and Station based Messaging platform! Chat with people listening to the same station with you!